An order of epiphytic acrocarps, about 100 species world-wide and forming cushions on trees or rocks. The leaves are lanceolate and recurved at the margin, and are either overlapping when dry (e.g. 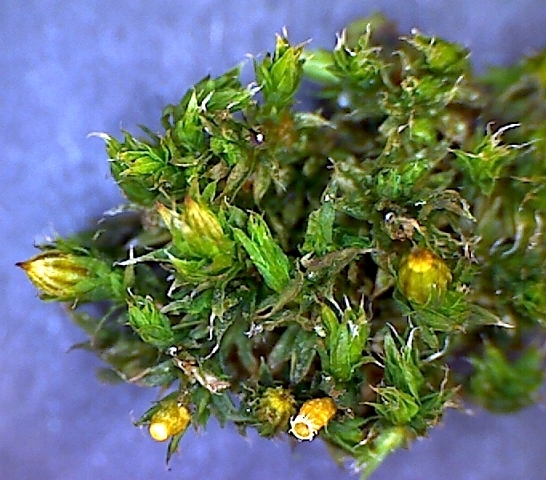 Orthotrichum) or twisted when dry (e.g. Ulota). If present, the capsule is oval or sub-cylindrical, with 8-16 ridges (striae), upright on a short seta (e.g. 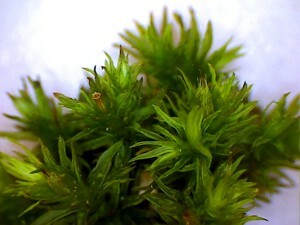 Orthotrichum) or a longer seta (e.g. Ulota and Zygodon). The capsule may be immersed in, or exerted above, the leaves. The calyptra is mitre shaped and sometimes hairy (e.g. Ulota). Orthotrichum affine – this is the most common Orthotrichum in Britain and forms small, loose and dark green tufts on tree trunks and branches. As in all species of Orthotrichum, the leaves are appressed and hardly twisted when dry but spreading rapidly and widely when wetted. It is often fertile, capsules are immersed and almost hidden amongst the upper leaves. The capsule has 8 longitudinal ridges and the 8 pairs of peristome teeth are recurved at maturity. Orthotrichum diaphanum – This species forms smaller, neat, rounded tufts usually 1 cm high or less on trees, fence posts and also walls. It has all the key features of Orthotrichum – lanceolate leaves little altered when dry, the short seta and immersed capsules with mitre-shaped calyptra and recurved peristome teeth at maturity. However, Orthotrichum diaphanum can be most easily identified from the silver-white hair points which distinguish it from all other British Orthotrichum species. The featured image at the top of this post shows Orthotrichum affine together with a range of foliose lichens.